Statistical Probability of Falling in Love, by Jennifer E. Smith (book review) – love is in the air? Dickens novel to throw at Dad? of course. Meeting Oliver makes the delay and the flight so much more bearable for her. All those crazy statistics he quotes – he must be making them up! Why, oh why couldn’t they have gotten to say a proper goodbye at Heathrow Airport before she had to find a taxi and rush to the wedding? 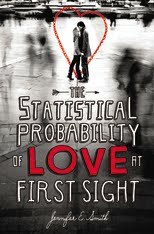 Book info: The Statistical Probability of Falling in Love / Jennifer E. Smith. Poppy Books, 2012. [author’s website] [book’s Facebook page] [publisher site] [Hadley’s book trailer] [Oliver’s book trailer] Review copy and cover image courtesy of the publisher. My Recommendation: Four minutes late! The plane is leaving; Hadley will be late for her father’s wedding. At least there’s a cute guy to talk to as her trans-Atlantic flight is rescheduled and she tries to calm down in the overcrowded airport. She can understand why Dad went to study in England – he is a poet, after all – but why did he fall in love with someone there? How could he leave her and Mom alone? Just sneaking in and taking his personal things from their house while they were on vacation – ha! How can he expect her to be a bridesmaid in this wedding and be happy? She’s never even met the woman – her new stepmother – arrgh! Thankfully, the cute guy is on her flight. Oliver is British, studying at Yale, listens a lot, talks a little. He even has the seat next to hers and helps Hadley relax on her first long plane ride, inventing silly statistics and listening to her worries about the future. Separated at the passport checkpoint in the London airport, Hadley hopes she can see Oliver one last time before she heads into a strange city and a strange new relationship with her father. With the delays, she’ll barely make it to the London church in time for the wedding. As the day goes on and Hadley moves her jet-lagged self through the ceremony and family photos, she feels compelled to find Oliver, to find out why he was returning to England suddenly, to see if he can come up with a statistic that will make her feel better about what lies ahead. Can she remember enough from their sleepy conversations to figure out where he is? Can she travel there without getting run over by traffic traveling on the wrong side of the road? Can she just make it through this nerve-wracking day and go back home to Mom, please? This actually sounds like a fun book, especially for the young adult women in my life, who would love the meandering thoughts & statistics of love’s paths taken. Thanks! I’m taking this one on the plane with me this weekend. Sounds great!